Everything is still moving smoothly since last time I wrote. The MPCs (master production copies, the first copies of the print run that they'll send to me to confirm everything is correct) should be done by April 15 (I'll show you photos! ), with the full print run finished around May 15. Then, of course, there is the time on the boat while they are shipped to warehouses, and then they'll be shipped out to you. The most important thing to note right now is that I'm going to lock down changes within the next few days, so if you want to add one more set or change anything around, this is your last chance. I'm starting to get numbers ready for the fulfillment house and figure out how many of each set need to be sent to different continents, and those numbers have to be final. You will still have an opportunity to change your address for another month or so (but if you're planning to move continents or countries, it would be great to update your address to reflect that now). If you are also curiously following along with the running of a Kickstarter and the manufacturing process, I'll tell you about yet another thing that has come up in the past few weeks. This won't have any effect on you, but it reduces the number of additional copies of Knot Dice Squared I'll have when all is said and done. It turns out that due to breakage and miscommunications, the dice factory wound up producing 500 fewer sets of rounded dice than I requested. That's pretty terrible. Now I'm going to have to figure out where to store those 500 sets worth of squared and bridge dice until I can place another order with them and the printing company for something else, and finish up those boxes. It also means that Knot Dice Squared will be available in very limited quantities after this campaign is done. Until next time, I hope you are having a wonderful spring! If you're in the Washington, DC area, make sure to check out the cherry blossoms in full bloom. Last weekend I performed with my taiko group (Japanese drumming) at the Cherry Blossom Festival, and it was beautiful! Hello! I promised I'd post an update as soon as I had more firm information on delivery dates, so here it is. Let me state up front that there is another delay, pushing us back another month or two. While all of the dice and print files were to the print manufacturer before Chinese New Year, the wooden tokens won't be finished and delivered to the factory until mid-April, meaning the boxes won't be finished and packed until the end of April. So they'll be on a boat from China at the end of April. I do not blame anyone else for this, it is a part of the process of putting together components from different manufacturers, and that is more a part of the Knot Dice process than most other projects, which I know better than anyone else. I am extremely sorry for this additional delay - because I appreciate your support so much and want to get you your rewards as soon as humanly possible, and because this is four months later than originally planned. I am asking the factories if there is anything that can be done to speed things along, and I am making sure that I have everything set up with the fulfillment house ahead of time, so when everything is delivered to them they can turn around and ship them out to you as quickly as possible. This is my hope. It may be a little optimistic, hoping that nothing else goes wrong along the way, and that we don't have any issues with customs. But I will do everything I can to make it happen. *Outside the US: I am talking with the fulfillment house (Quartermaster Logistics) to see if I can ship backers' rewards directly to their shipping partners in other countries--Canada, Australia, the EU, and the UK--in order to fulfill on a similar timeline (rather than shipping to the US first and then on to the shipping partners in other countries). It is possible that it will be a little later than that, but I'm hoping not terribly much so. Again, I am so sorry for the delays. I will post additional updates to keep you informed as we pass every one of these last few steps. Hello again! I hope the winter has been treating you all well so far. The production of Knot Dice Squared continues to move forward. I've fully paid the dice manufacturer, since they've finished their part of the process and sent the dice to the printer. I've sent 1/2-payment to the printer, and the other half and the shipping costs are being kept in reserve for when they're ready to be shipped. Chinese New Year is coming up, so there won't be much happening for a couple of weeks, but we're in the printer's production schedule, so we should be fine there. I am working with Quartermaster Logistics for most of the fulfillment of this campaign, and with their partners in other parts of the world. However, they generally work with a European partner that I've heard has caused many delays in fulfillment, so I'm hoping to work with Meeple Logistics in Europe (partnering with Quartermaster). I would have been happy to work with Spiral Galaxy Games who do outstanding work, but with Brexit coming on that seemed like a dangerous proposition. Thank you to everyone who gave suggestions about European partners - I appreciate being able to reach out to experienced backers to find out what has worked for you in the past. The wooden boxes from Dogmight have arrived! Boxes of boxes. They look fantastic. There is a fair amount of variation in color between the boxes, but I really like that - you'll have a unique box for your Knot Dice. There is one thing I wanted to make you aware of: the divider in the box (that will go between your dice and your wooden tokens) does not come installed. This is so you can set it wherever you'd like, and so it can fit your dice quantity. It's easy enough to set in place (with a little pressure), and is held there with little rubbery caps on the end of the divider. Just wanted to make sure you knew what that extra piece of wood was in your box. In other news, I just got back from San Antonio where we were demoing a new game by Ben Rosset and myself, The Search for Planet 9. This is a logic puzzle competitive game which was selected for the PAX South Indie Showcase and was ranked top at Stonemaier Design Day 2018. I'm not publishing that game, but I'm very proud of the design. You can get more information and sign up to be notified about the Kickstarter here: https://foxtrotgames.com/planet9/. Would you like me to mention other games I'm working on (just as asides, not full separate updates), or would you prefer if I kept these updates to Knot Dice and directly related projects? So, for those of you who stuck around until the end, here's a little design with the blue dice (still the prototypes - I can't wait to get the final dice!). Hello! Sorry to send another update so soon, but I think it's important to make sure this clarification gets to everyone. I have not sold any of the products from this Kickstarter campaign, not through retail or directly, nor will I sell any until backers have their copies. I know that happens sometimes, but that has not happened here. Let me say it again: Knot Dice Squared, the blue dice, and the reprint sets will go to backers first. I apologize for any confusion growing out of my previous message. That message was referring to the original print run of Knot Dice which were manufactured after the first Knot Dice campaign several years ago. Hello! I hope you are looking forward to a nice winter break. I have two pieces of news for you in the world of Knot Dice. 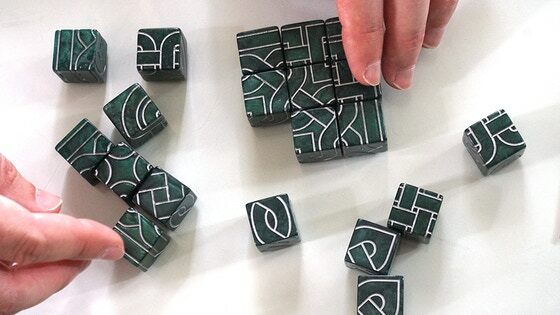 Knot Dice sold so well at PAX Unplugged (and a few days afterward), that they are all gone! There might still be a few copies at retailers, but the warehouse is empty (or at least my little section of it). The dice manufacturer ran a few weeks behind schedule delivering the final batch of dice, and the print manufacturer can't start the print run until all the dice have arrived, AND this is going to make the print run overlap Chinese New Year (when just about everything shuts down for 2-3 weeks). This means that instead of February, we're probably looking at shipping the dice out in April. I know this is disappointing to you - it's very disappointing to me as well. I thought that I had built enough room into the schedule to make sure to deliver on time, but it looks like I was still too optimistic for all of the moving parts involved in this process, and for the complex dice manufacturing requirements. I hope that you can forgive my imperfect scheduling, and that you find the dice are well worth the wait when they do arrive. Thank you for your patience, and enjoy the holidays ahead!